Creating a program with RobotBuilder is a very straight forward procedure by following a few steps that are the same for any robot. This lesson describes the steps that you can follow. You can find more details about each of these steps in subsequent sections of the document. In addition to the text documentation provided here, a series of videos about RobotBuilder and many other FRC Robotics Engineering topics is also available. Your robot is naturally made up of a number of smaller systems like the drive trains, arms, shooters, collectors, manipulators, wrist joints, etc. You should look at the design of your robot and break it up into smaller, separately operated subsystems. In this particular example there is an elevator, a minibot alignment device, a gripper, and a camera system. In addition one might include the drive base. Each of these parts of the robot are separately controlled and make good candidates for subsystems. PIDSubsystems - often it is desirable to control a subsystems operation with a PID controller. This is code in your program that makes the subsystem element, for example arm angle, more quickly to a desired position then stop when reaching it. PIDSubsystems have the PID Controller code built-in and are often more convenient then adding it yourself. PIDSubsystems have a sensor that determines when the device has reached the target position and an actuator (speed controller) that is driven to the setpoint. Regular subsystem - these subsystems don't have an integrated PID controller and are used for subsystems without PID control for feedback or for subsystems requiring more complex control than can be handled with the default embedded PID controller. As you look through more of this documentation the differences between the subsystem types will become more apparent. Each subsystem consists of a number of actuators, sensors and controllers that it uses to perform its operations. These sensors and actuators are added to the subsystem with which they are associated. Each of the sensors and actuators comes from the RobotBuilder palette and is dragged to the appropriate subsystem. For each, there are usually other properties that must be set such as port numbers and other parameters specific to the component. 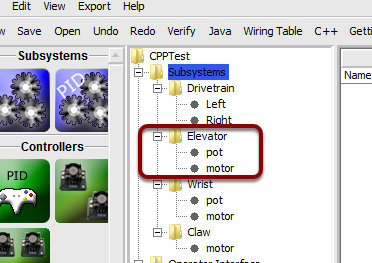 In this example there is an Elevator subsystem that uses a motor and a potentiometer (motor and pot) that have been dragged to the Elevator subsystem. Normal commands - these are the most flexible command, you have to write all of the code to perform the desired actions necessary to accomplish the goal. Command groups - these commands are a combination of other commands running both in a sequential order and in parallel. Use these to build up more complicated actions after you have a number of basic commands implemented. Setpoint commands - setpoint commands move a PID Subsystem to a fixed setpoint, or the desired location. 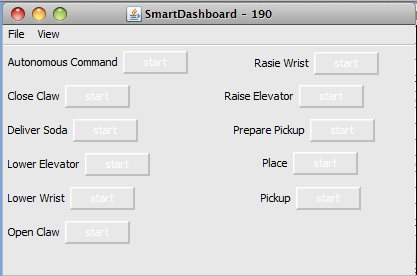 Each command can be run from the SmartDashboard. This is useful for testing commands before you add them to the operator interface or to a command group. As long as you leave the "Button on SmartDashboard" property checked, a button will be created on the SmartDashboard. When you press the start button, the command will run and you can check that it performs the desired action. By creating buttons, each command can be tested individually. If all the commands work individually, you can be pretty sure that the robot will work as a whole. The operator interface consists of joysticks, gamepads and other HID input devices. 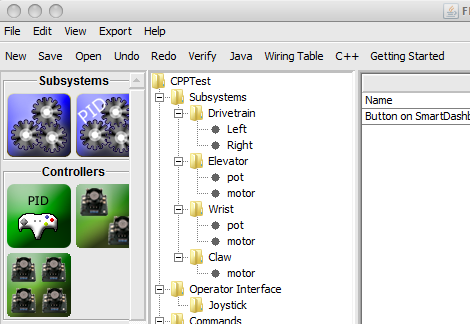 You can add operator interface components (joysticks, joystick buttons) to your program in RobotBuilder. It will automatically generate code that will initialize all of the components and allow them to be connected to commands. 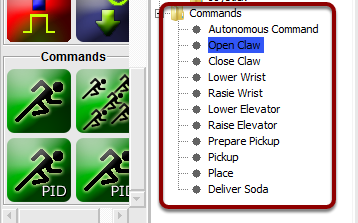 The operator interface components are dragged from the palette to the "Operator Interface" folder in the RobotBuilder program. First (1) add Joysticks to the program then put buttons under the associated joysticks (2) and give them meaningful names, like ShootButton. Commands can be associated with buttons so that when a button is pressed the command is scheduled. This should, for the most part, handle most of the tele-operated part of your robot program. This is simply done by (1) adding the command to the JoystickButton object in the RobotBuilder program, then (2) setting the condition in which the command is scheduled. Commands make it simple to develop autonomous programs. You simply specify which command should run when the robot enters the autonomous period and it will automatically be scheduled. If you have tested commands as discussed above, this should simply be a matter of choosing which command should run. 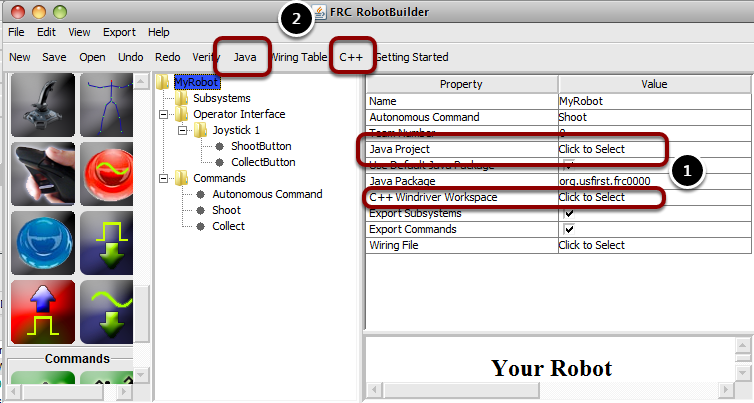 Select the robot at the root of the RobotBuilder project, then edit the Autonomous Command property to choose the command to run. It's that simple! At any point in the process outlined above you can have RobotBuilder generate a C++ or Java program that will represent the project you have created. This is done by specifying the location of the project in the project properties (1), then clicking the appropriate toolbar button to generate the code.